Smoking shelters are an important consideration for many businesses, campuses, health facilities, and residential building complexes. Though their name implies exclusivity, smoking shelters can be used by anyone who needs a protected area where they can seek refuge from the weather. So what is a smoking shelter? What are their defining characteristics and how do you know whether your business needs one? Learn the answers to these questions and more in today’s blog, below. 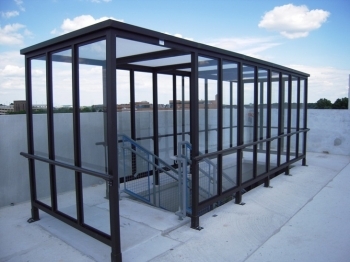 Smoking shelters are useful for a wide variety of applications. Smoking enclosures are incredibly versatile structures. At their simplest, a smoking shelter is simply an area underneath a ceiling or roof. Their purpose is commonly to provide shelter during inclement weather, so they do not have to include walls, seating, or any other features aside from some type of covering. However, they are also extremely customizable and can be built to the needs and specifications of your facility. At Shelters Direct, we fabricate each smoker’s shelter to order, which means you can choose the features you’d like. Whether you prefer the architectural stylings of a standing seam hip roof, benches, or even decorative framing members, we can create and install the perfect smoking shelter to meet your needs. Many smoking enclosures are built with open ventilation space, but if you prefer a fully enclosed structure, we can accommodate. We have created many smoking shelters that are entirely enclosed and include separate exhaust and ventilation systems as well as full length walls and doors that close automatically. Manufactured out of durable aluminum or steel, smoking shelters are designed to withstand the elements and last for decades. Whether you manage a hospital, assisted living facility, public building, manufacturing plant, restaurant, hotel, or casino, a smoking shelter will provide comfort and security to your clients and staff. We design each shelter not only to the customer’s needs, but we also factor in local snow and wind loads for every quote we do, so you can be sure to have a quality long lasting shelter. Shelters Direct has been a trusted source for the supplying and installation of canopies, shelters, and prefabricated booths for over 20 years. We work with a wide variety of clients throughout the United States and abroad to provide quality products and expert installation so you can be confident that we will get the job done right. Interested in learning more about how a smoking shelter could benefit your business? Contact us today! And don’t forget to keep up with us on Facebook, Twitter, Google+, and LinkedIn too. This entry was posted on Friday, March 11th, 2016	at 3:37 pm	. You can follow any responses to this entry through the RSS 2.0	feed. Both comments and pings are currently closed. Ask the Shelters Team: Why Do I Need a Mobile Guard Shack? Copyright © 2019Tanks Direct. All rights reserved.